When it comes to skin care, you have those who say "if it works, stick with it." However, I'm not of that opinion; my philosophy is "listen to your skin." As the seasons change, so changes the needs of my skin. Based on those demands, there are several brands/products I like to rotate between, and today I'm going to share with you the products I like to use during summer, and a brief description of my skin care regime. 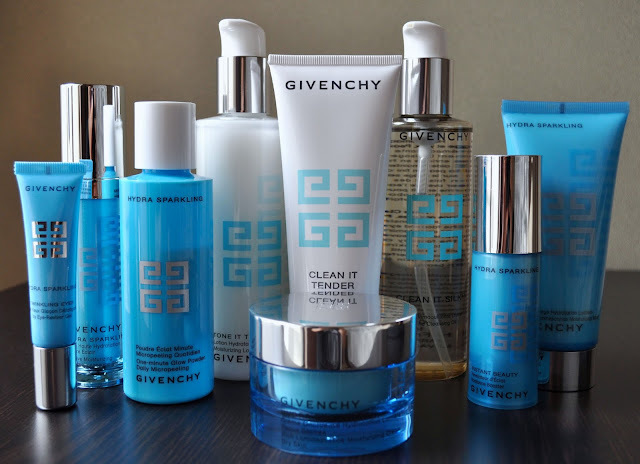 As blantantly shown in the photo above, all the products are Givenchy, with a majority of them from their Hydra Sparkling line. I'm a diehard (and I'm not talking about Bruce Willis) patron of everything under the Givenchy beauty umbrella; the brand really does have my heart. Hydra Sparkling One-minute Glow Powder Daily Micropeeling: This exfoliator is great! It does a terrific job at removing impurities, refining pore, and clarifying without leaving residue or stripping the skin of any moisture. Here's how I use this refined mico-exfoliating powder: I shake, shake, shake a reasonable amount into the center of the palm, add a little bit of water to the powder, and massage the mixture with the my index and middle fingers (of my opposite hand, of course) until I get a foamy consistency. Next, I rub both hands together, and in circular motions, massage the lather all over my damp face for a few minutes. After use, my skin is smooth, hydrated, with a polished, youthful glow. The One-minute Glow Powder is so refined it can be used daily, but I use it two to three times a week as a pre-wash before my cleansing foam. Also, the One-minute Glow Powder suitable for all skin types. I will say, this product will give some sticker shock, retailing for 7,344 yen (30g/1 fl oz). 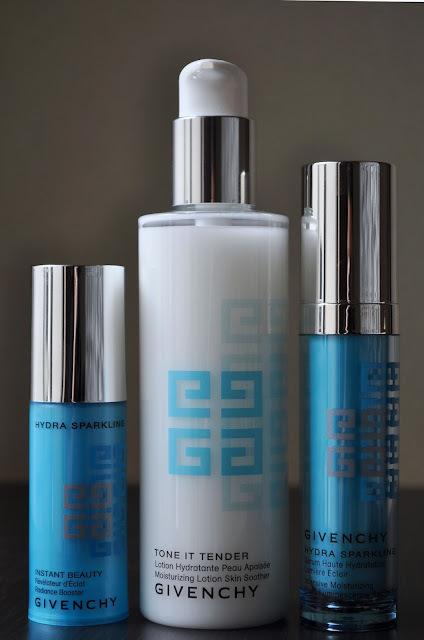 In the future I will be purchasing the Hydra Sparkling One-minute Glow Powder Daily Micropeeling cleanser through escentual.com. At £29.50 (4,072 yen after conversion) and £4.95 shipping, it's a lot cheaper then purchasing at my local counter. Now, the next two items were purchased from escentual.com. Clean it Tender Creamy Cleansing Foam (125 ml/4.4 fl oz): suitable for normal to dry skin (that's me!). Using a small amount, this cleansing foam works into a rich lather, and gently cleanses the skin. My skin is left clean, balanced, moisturized, with a fresh faced glow. Here's how I wash my mug: First, I wet my face with warm water, massage the cleanser for a few minutes, and rinse it off with ice cold water. If any of you do this same thing, please leave a comment because I would really like to know. Again, the Clean it Tender Creamy Cleansing Foam was cheaper on escental.com at £22.00 (3,049 yen after conversion) compare to 4,644 yen over here. Clean It Silky Divine Cleansing Oil (200 ml/6.7 fl oz): This is one of my favorite oil cleansers, but outside of Narita Aiport (which I remember paying something like 6,000 yen), I haven't seen it at any of the Givenchy counters I frequent; hence, why I purchased it for £24.50 (3,398 yen after conversion) on escentual.com. Silky and divine are such appropriate words to use for this product, as it does feel silky and divine as you rub it on the skin. Using two pumps, I work the product all over my face, and then another pump for the eyes. Clean It Silky works superbly at melting away, and leaving no traces of makeup (even the most stubbornest of waterproof products), or residue. Instant Beauty Radiance Booster (30 ml/1 fl oz): My work days are extremely long, and I'm basically a vampire. So, I don't get much sleep. To compensate for my lack of z's, I rely on this little blue bottle in the mornings to give my complexion an extra injection of hydration, and a radiant glow, while helping to fight signs of dullness and fatigue. Another thing I love about this product is, it can be applied on the eye area as well. I solely use this serum in the mornings, after my toner, but before my moisturizer. The Radiance Booster is very hydrating, and at times I forego my moisturizer, and move onto my makeup. And, on that note, Instant Beauty Radiance Booster works swimmingly under makeup. Tone It Tender Moisturizing Lotion Skin Soother (200 ml/6.7 fl oz): I prefer applying Tone It Tender with my finger tips, but I have been known to use a cotton pad from time to time. There's a subtle cooling effect on the skin, as the toning lotion soothes, and preps the skin for the next step in my regime. Again, I had to buy this product on escentual.com, because I couldn't find it in Tokyo. I tell you, dry-skinned ladies get no love over here. Hydra Sparkling Intensive Moisturizing Flash Luminescence Serum (30 ml/1 fl oz): The Flash Luminescence serum is my night time serum, and I apply it before my moisturizer. As with the Instant Beauty Radiance Booster, I enjoy how both serums nourish and illuminate the skin as well as enhancing the benefits of my moisturizer. In the mornings, my skin looks supple, laminated, and revitalized. Hydra Sparkling Twinkling Eyes Icy Eye-Reviver Gel (15ml/.5 fl oz): this eye gel already has an subtle icy effect, but for an extra frosty bite, I store this eye gel in the fridge, and look forward to putting it on. The gel has a slight iridescence sheen, giving the eyes a rested, soft-focused luminescence. I don't have issues with dark circles or puffiness; therefore, I can't attest to those claims. However, it does rejuvenate and moisturize. Hydra Sparkling Rich Luminescence Moisturizing Cream-Dry Skin (50 ml/1.7 fl oz): I use this moisturizer in the mornings and evenings, and I love how my skin just drinks it up. Also, I like the fact that this moisturizer is non-greasy and quickly absorbs into the skin, and doesn't leave my face feeling tacky (big plus in this muggy weather). My skin is always well-moisturized and feeling comfortable in this hell I call Summer. Hydra Sparkling Recharging Luminescence Moisturizing Mask (100 ml/3.5 fl oz): I use this mask once a week on sundays as part of my "brace yourself for the hellish week" pamper myself at home day. The directions say to leave the mask on for 5- 10 minutes and remove the excess with a tissue. But, I do it a little differently; I leave the mask on for about 20 minutes, then I place a damp, warmed wash towel over my face, and gently press the towel onto my skin to remove any excess. 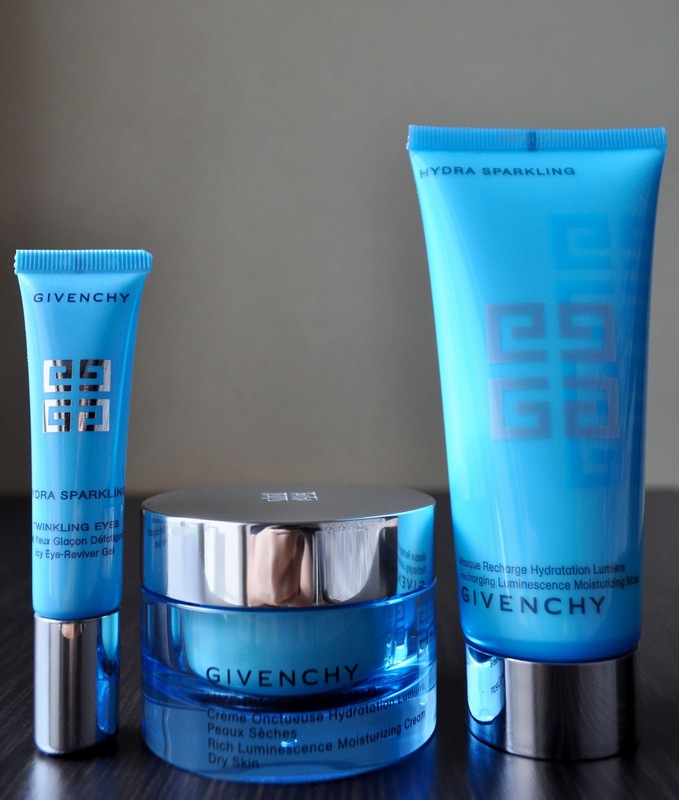 One product missing from my summer routine is my preferred nighttime moisturizer, Givenchy's Hydra Sparkling Night Recovery Moisturising Mask/Cream. My counter was out, and I forgot to order it on escentuals.com. Be prepared to see this product pop up in a future post. I feel like a broken record with all the "my skin looks /feels moisturized and luminous." But, all these products, and the layering of them, keep my skin hydrated, revitalized, and radiant. Apart for the Twinkling Eyes Icy Eye-Reviver Gel, all these product have that clean, refreshing floral Givenchy scent that I love. If you've tried any of these products, please share your experience with them. Also, what's your summer skin care routine? I just wanted to say that Icy Eye Reviver Gel is like the best name for an eye cream you'd use in the summer. I've been using TATCHA's Eye Serum in the mornings and it has a cooling ceramic tip that feels heavenly on the under eye area. I've never followed a complete skincare routine from one brand; the closest I've come is Paula's Choice but I still had to supplement with a cleansing oil, eye cream and masks. Right! I'm not sure if you already do this Monika, but store your eye cream in the fridge; feels awesome! Having all products from one brand is my OCD acting up. Basically, it depends on the brand. I like to see how my skin fairs from using everything from one line. My name is Francois Sagat and I am single. I am not dating Oliver anymore and the only person in my life is my cat. Please check out my page. www.francoissagat.com Also Jodie Harsh will not return my calls! I pray for Diarrhea!!! I am single Completely single? Anywho, I love to eat cake with ice cream on the weekends. It is fun to do this once per month.